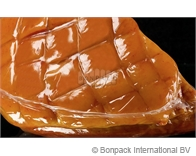 AMIVAC MBL – barrier shrink bags meant for vacuum packing, storing and sale of sausages and specialties as well as other foodstuffs without bones or other rough inclusions. AMIVAC MBL can be sealed over folds and with an overlap that enables to increase the efficiency and reduces the repacking rate. • High barrier properties insure long shelf-life of the packed products. • Low vapor permeability excludes humidity loss (weight loss) of the product during storing. • Optical properties of the bag (transparency, gloss) allow to demonstrate the product in the most attractive way for a buyer. • High strength characteristics insure the preservation of packed products during transportation and storing. • Individual airtight packaging of AMIVAC MBL bag packs guarantees their protection from the adverse environment effect all warranty shelf-life period through and insures a high hygiene and sanitary level of bags. • The products packed in AMIVAC MBL preserve their natural smell and taste during the whole storing period. The recycling of a packaging that does not contain chlorine-containing substances does less harm to the environment. • For the production of bags AMIVAC MBL one uses only those raw materials that are allowed to the direct contact with foodstuffs in accordance with the law of Russia, Ukraine, European Union and USA. That means that in case of export deliveries and if the local certification is needed AMIVAC MBL bags will not be an obstacle in receiving allowing hygienic documents. Printing: The AMIVAC MBL bags can be used for single- or double-sided printing. The number of colors varies from 1+0 to 8+8. CMYK printing is optional. • In reels with tear-off perforation. • In reels without perforation. • Taped on two tapes (for using on full-automatic machines). • Cut into separate bags, packed in shipping bags by 100 pcs.